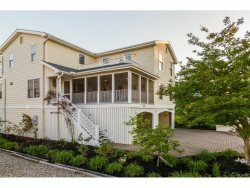 Oceanfront - Direct access to the Beach and Boardwalk - 6 Bedroom /4.5 Bath Single family home offering CA, W/D, Dishwasher, TV-VCR-DVD, telephone, Gas Grill, Fireplace, Ceiling Fans, Decks overlooking The Boardwalk and beach with a view of the Ocean that is fantastic. Large Great room, Outside shower, and only a few yards to Garfield Parkway and restaurants and shops. Non-smoking and No Pets.